The Delaneys Corner sign can usually be found on the Warrnambool - Peterborough Road at Nirranda in the Western District of Victoria, Australia. It does prove rather popular with a certain element in the area so it may not be there when you pass by but keep an eye out for it anyway. To the right is a recent VicRoads map showing Delaney (sic) Corner on the Great Ocean Road. The original blocks (see below) lie between Boggy Creek Road and Callaghans Road on the Great Ocean Road. 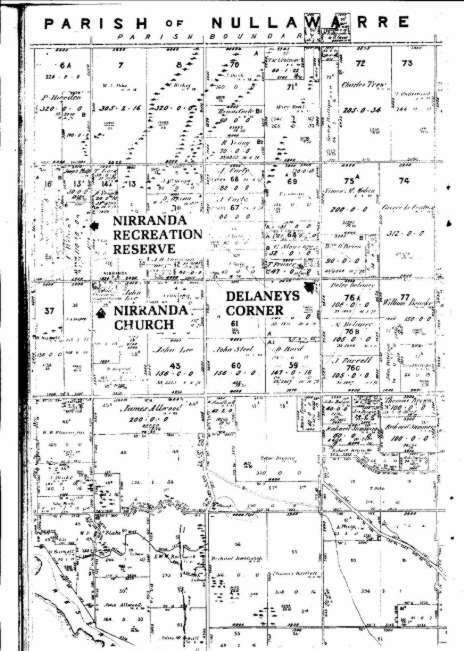 This is a parish map from the 1920s shows Delaneys Corner to the left of lots 76A Peter Delaney, 76B M Delaney and 76C J Farrell which are the 3 original blocks totalling 316 acres, taken up in 1866 and cleared by the Delaneys under the Duffy Land Act of 1862.